So you have stepped into the real world of parenting! Congratulations. So long you have been hearing a lot of discussions on being a mom or dad but somehow until and unless you actually step in, you have no idea what all it brings in. Parenting no doubt is an overwhelming experience and brings in lots of wanted and unwanted surprises. While it completes the family with strong bonding, it adds a lot of responsibilities on your shoulder. With responsibility and obligation comes an uninvited guest-Stress. In this article, we shall talk about parental stress. When parenting becomes exhaustive and difficult for parents to handle issues and situations at home with regards to children, it is parental stress. It seems Stress is an inevitable part of parenting nowadays. With every stage of parenting right from pregnancy to adolescence of the kids, parents are stressed. Significantly the stress never vanishes with time, rather the degree and level changes from time to time. When you are a new mom or pregnant, you are stressed with pregnancy and childbirth anxiety. When your baby is just born, you get stressed out due to a sudden change in your life both physical and mental. You need to deal with Post-partum depression when you are a new mom and for new dads as well situation gets challenging sometimes trying to manage newborn, supporting a wife and dealing with household and work issues. At different levels of child growth and development at various stages, parents often feel the pressure and stress of parenting. There is no doubt about it. “I am a mother of 3 kids. My boys are 14 years, 11 years and 3 ½ years old. My husband works full time and is very busy. He works day and night to ensure basic amenities are made available for the family. He is extremely stressed as he works overtime and takes extra loads to meet the expenses. Therefore, I am the only one taking care of the kids and managing the house. My money is short since I had left my job for my little one to take care of. I get no help from any neighbor or close relatives to give me any relief from my 24/7 on the job duty. My children have their own demands and expectations which I struggle to provide. There is constant noise, shouting, yelling and fighting in the house. I feel thankless, helpless and tired and all these adds on to the stress level.” I have shared my personal experience here to explain how badly parental stress can affect you. This is the condition of most middle-class families today. Now let us learn how to deal with this situation. How to cope with Parental Stress? One of the most challenging parts of parenting is that we are always been watched and recorded by our children. Children learn from our actions and behaviors and they repeat the same as others. No matter how much you counsel and give those moral lessons or value, they will copy the practical demonstration that you show up when you deal with your situations. The came rolls continuously and everything is recorded instantly whether you like or not. Sounds quite intimidating? Yes, but it is true. Children copy parents’ behavior and consider them as role models consciously or unconsciously. 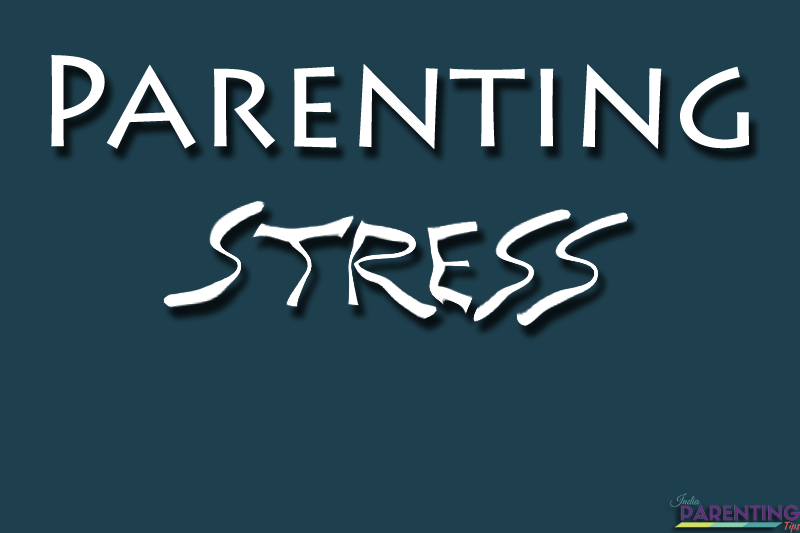 Let us find out some cool stress bursting techniques for parents to be stress-free. Cut the frills - Unscramble your life and make it simple. Learn when and how to say No when required. You cannot and need not say yes to everything. Affirmation is not always that is supposed to be the rule to live happily. Do not go overboard with things and over commit yourself. You need not make sacrifices always to make everyone happy in your family. You have rights on yourself as well to be happy. Only when you are happy, your family would be happy and peaceful. So go pamper yourself with somebody massage or foot massage for relaxation if you want. Do not limit yourself with too many commitments that you forget yourself. If there is a new sale in the nearby mall and you would like to go and check out, go for it. Check your sleep pattern - Make sure you get enough of sleep as much your body requires. Mostly new parents face the challenges of not getting enough of sleep. In this case, try taking small naps whenever possible. Listen to some nice melody and keep the room atmosphere calm and peaceful. It can be some nice room spray, dim lights with low background music that can be pleasing for both you and your partner. Try sleeping when you can if you can’t get sleep at a stretch. Disciple the children to sleep early. No late night movies or video games. No carrying the tablets or mobile phone in the children’s room. Make rules in the house and stick to it. Don’t take things in your heart - Very often we come across situations when we feel hurt to the core while the other person who shouted out the spleen feels we are over exaggerating things and it is no big deal. We think those people are emotionless. No heart. Actually, you do not need to attach your heart to every little non-sense people speak. It’s your heart. It is not a tag! Mind it. Protect it and do not attach it to everything all the time. People have their right to an opinion and you must respect it. You need to accept it as true to your belief. Example: If your mother-in-law tells you that she was a perfect homemaker with a spotless house and disciplined children and blames you to be a careless freak, you need not take it in your heart and internalize that declaration as your certificate of worthiness as a mother. It is her opinion. It is the way she thinks. You need not agree to it nor be reactive to it. It’s okay. You can’t make everyone happy in your life. You need not. Prioritise your needs - You are not a superwoman and you need not be a jack of all trades. When you have a list of things to do tasks in your head, first list it out in pen and paper. Once done check which things demand immediate attention and action. Those that are urgently required should be attended first. Like child’s vaccination, attending your child’s Parent’s Teacher Meeting or any other commitment for which there is a limited time frame. The rest can be dumped for weekends or holidays to be taken care of by taking help of your partner. Imperfection is innovation - Perfection sometimes becomes boring and monotonous. A house with strictly ordered instructions and no little imperfection becomes a hotel not a haven of coziness and carefree life. If everything is kept right on the right place, there is no change in things, no small little things around like a baby toy or maybe some books around it does not look like a children’s room, does it? Aiming for perfection constantly and regularly sometimes create a great deal of stress. Leave it. Schedule time for cleanups and discipline the child accordingly without stressing them out. Learn to escape for a quick breather - Try getting some breather from time to time and escape with your partner for at least half an hour whenever possible. If you have a trusted friend or a close relative, try reaching out for help and ask them to babysit for a while till you come back. If you know any trustworthy babysitters that you can trust, that could also be another option. In case, like in my case when you don’t have either and you are too scared to trust unknown strangers babysitting your kid, at least ensure proper sleeping habit is inculcated. When your child sleeps, go to the terrace with your spouse for 10-15 mins and feel the fresh air. Sit with your partner and try to relax. Keep the lights dim and light music on. Try breathing in and out and talk to one another about everything on your mind. Talking helps and heals a lot of stress. This can also be a nice booster to revive and rekindle lost love due to parental stress. I have shared some quick and easy to follow guides for a stress-free parenting. Based on my own personal experience and things that I have learned in my life, I thought it is best to share with others who might need help to deal with parental stress. I am eager to know your thoughts as feedback.